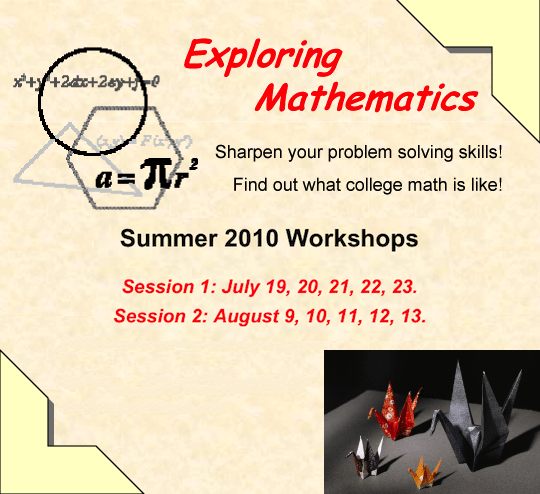 The Mathematics Department at Dartmouth College and the Center for Mathematics Education at Dartmouth are pleased to announce two summer enrichment workshops for local high school students. Here is a chance for students to interact with mathematicians in a fun, nongraded environment. Topics covered will be outside of the usual high school syllabus. An exploratory approach will be emphasized. Each program will cover different mathematical topics and students are invited to attend one or both sessions. Session 1: July 19, 20, 21, 22, 23. Session 2: August 9, 10, 11, 12, 13. Workshops will meet from 1:00 to 4:00 in Kemeny Hall on the Dartmouth Campus. Program cost for each workshop is $20.00. Contact Tracy Moloney, 603-646-3723, for more information or to apply.